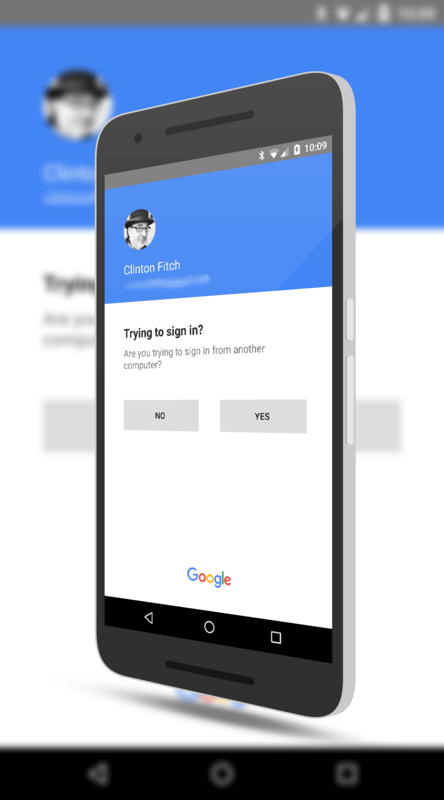 Google has made a small but nice improvement to their authorization process of account access for those with 2-factor authentication enabled. Previously, in order to approve a device accessing your account, you had to either get a text message to your phone or use the Google Authenticator app. Now you can get a simple, full screen notification on your Android phone to approve access to your account. It’s simple and effective and far faster than waiting on that text or opening the Authenticator app. Google. That change can be done on the My Account site with Google. Once it is setup, you will get the notification on your phone without having to use SMS or the Authenticator app. The idea being that it is faster and if you have your phone nearby, you can simply tap Yes on that notification and your device can access your account. In order for the authorization to be approved, your phone must be unlocked. That means if your phone is stolen and you have it password or fingerprint protected, nobody can access your account even if they have your phone. As I have written many times here on the site, 2-Factor authentication is a must to have on your online accounts, Google or otherwise. It provides a layer of protection to your account which a simple password, regardless of its complexity, cannot do. If you have not enabled 2-Factor I highly recommend you do it on all of your accounts.